2019. (Duranton & Horowitz). Let me sniff! Nosework induces positive judgment bias in pet dogs. Applied Animal Behaviour Science, 211, 61-66. 2017. 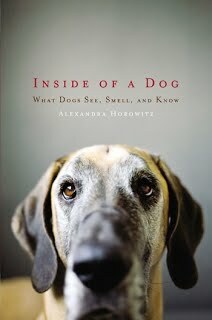 (Horowitz) Smelling themselves: Dogs investigate their own odours longer when modified in an “olfactory mirror” test. Behavioural Processes, 173, 17-24. In sum: This study translates the "mirror mark" test of self-awareness for a species whose primary sensory modality is olfaction, and finds that dogs show more investigative interest in their own odours when modified. 2016. (Horowitz & Hecht). Examining dog-human play: The characteristics, affect, and vocalizations of a unique interspecific interaction. Animal Cognition, 19, 779-788. In sum: Via a global citizen science project, we solicited videotapes of dog–human play sessions from dog owners. We coded 187 play bouts via frame-by-frame video playback. Amount of physical contact (“touch”), level of activity of owner (“movement”), and physical closeness of dog–owner dyad (“proximity”) were highly correlated with positive affect. Owner vocalizations were found to contain different elements in positive- and neutral-affect play. One novel category of play, “tease”, was found. 2015. (Hecht & Horowitz). Looking at dogs: Human preference for dog physical attributes. Anthrozoös, 28, 153-163. In sum: This study investigated peoples’ preferences for dog physical attributes in images of real-life dogs. Subjects showed a preference for some features associated with the infant schema—large eyes and wider-set eyes—and also for human-like attributes of colored irises and a distinct upturn of the commissure, seeming to capture a smile. 2013. (Horowitz, Hecht, & Dedrick) Smelling more or less: Investigating the olfactory experience of the domestic dog. Learning & Motivation, 44, 207-217. In sum: Companion dogs do not reliably discriminate quantities when the food can be smelled but not seen. However, subjects gave more attention to the plate containing the larger quantity. Also, owner interest in a plate holding a lesser quantity of food reliably leads dogs to approach that plate. 2012. (Horowitz) Fair is fine, but more is better: Limits to inequity aversion in the domestic dog. Social Justice Research, 25, 195-212. In sum: Dogs showed a greater sensitivity to the quantity of a reward than to the fairness of a reward. Subjects selected a trainer who had treated them "unfairly," yet who presented a potentially greater opportunity for future rewards. 2011. (Horowitz) Theory of mind in dogs? Examining method and concept. Learning & Behavior, 39, 314-317. In sum: Even the best-designed theory-of-mind tests have intractable logical problems. I call for the introduction of an intermediate stage of ability, a rudimentary theory of mind, to describe performance. 2009. (Horowitz) Disambiguating the "guilty look": Salient prompts to a familiar dog behavior. Behavioural Processes, 81, 447-452. In sum: The behaviors of fourteen domestic dogs (Canis familiaris) were videotaped over a series of trials and analyzed for elements that correspond to an owner-identified "guilty look." Trials varied the opportunity for dogs to disobey an owner's command not to eat a desirable treat while the owner was out of the room, and varied the owners' knowledge of what their dogs did in their absence. The results revealed no difference in behaviors associated with the guilty look. By contrast, more such behaviors were seen in trials when owners scolded their dogs. The effect of scolding was more pronounced when the dogs were obedient, not disobedient. These results indicate that a better description of the so-called guilty look is that it is a response to owner cues, rather than that it shows an appreciation of a misdeed. 2009. (Horowitz) Attention to attention in domestic dogs' (Canis familiaris) dyadic play. Animal Cognition, 12, 107-118. In sum: This paper reports on research of domestic dog dyadic rough-and-tumble play. The sequential behaviors and head-direction of both dogs were noted throughout the bouts. Play signals were sent nearly exclusively to forward-facing conspecifics; attention-getting behaviors were used most often when a playmate was facing away, and before signaling an interest to play. These dogs showed attention to, and acted to manipulate, a feature of other dogs that mediates their ability to respond: which feature in human interaction is called "attention". 2007. 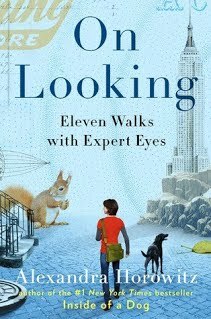 (Horowitz & Bekoff) Naturalizing anthropomorphism: Behavioral prompts to our humanizing of animals. Anthrozoös, 20, 23-35. 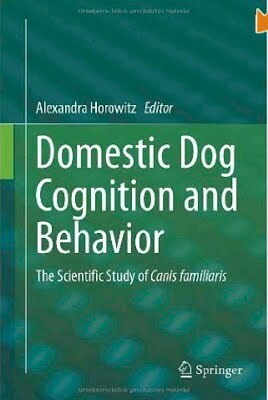 In sum: We bring together previously disparate accounts of why and how we anthropomorphize and suggest a means to analyze anthropomorphizing behavior itself, via analysis of bouts of dyadic play between humans and a heavily anthropomorphized animal, the domestic dog. Four distinct patterns of social interaction recur in successful dog-human play: directed responses by one player to the other, indications of intent, mutual behaviors, and contingent activity. These findings serve as a preliminary answer to the question, "What behaviors prompt anthropomorphisms?"